Last year, some tournament anglers fought tooth and nail to change Michigan’s bass seasons. Topping the agenda was a year-round catch-and-immediate-release bass season, which passed. But Department of Natural Resources biologist Mike Thomas says not too many anglers are taking that opportunity. Michelle Jalaba of Birmingham is taking advantage of it. 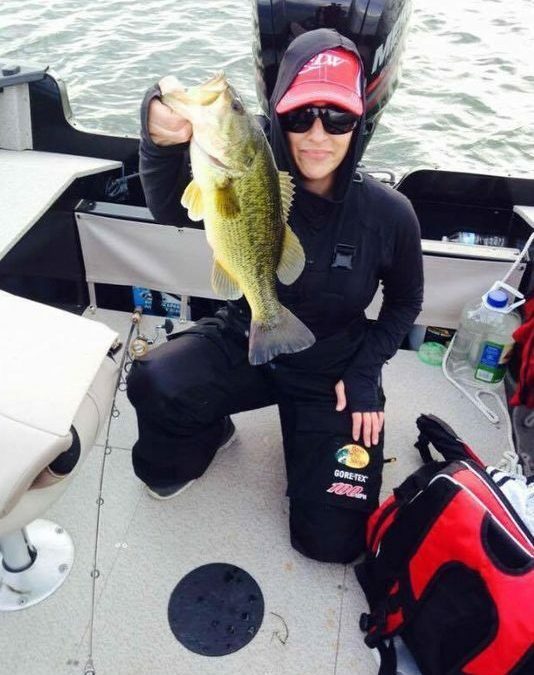 She is entering her first Fishing League Worldwide tour as a professional angler and gets out every day. But she is concerned: It seems like many would-be anglers along the shores of Lake St. Clair are unable to benefit from the rule change — or even fish at all. Mike Gutow is among them. He grew up envisioning a home where he could fish from shore. Finally, in 2011, the couple took a risk and bought a house that required renovation right on the lake. “We took a look at the lake and the seawall and imagined all the good times we would have fishing and jumping off the seawall with our kids,” Gutow said. Everything was fine until they had a storm. The goo clung to his sea wall and at least a dozen others. There was speculation it was a repeat of an incident in 1994, when tons of excess vegetation growth exacerbated by fertilizer filled the neighborhoods with rotting plant matter. It would turn out to be something worse, Gutow said, but it took a while to figure this out. First, Gutow noticed the beach was closed and wondered if there was a correlation. It took him a lot of time to correlate the discharge information to beach samplings and closures, but he ended up with 20 years of data that said the beaches were closed a majority of the time after a discharge. This led to another realization. “The beaches only get tested two to three times a week,” he said. “The test results don’t come back for two or three days. My mind started racing. I realized the beaches should have been closed three days prior. So people are swimming in sewage, relying on testing to tell them when it’s safe. Everyone is swimming in this filth. State Rep. Anthony Forlini, R-Harrison Township, said tests proved Gutow was right. He, too, realized beach closures were based on data from two days prior. Forlini got the state to appropriate funding for a testing system that would put up the results in a couple of hours. And though they’re testing the lake daily for waste, Forlini said they still shut down the beaches based only on the results of the old testing method. Gutow said: “This isn’t just about sewage and poop. The concern is that humans are also releasing antibiotics, radiation, hormones, and it’s chemicals going into the lakes unfiltered, affecting the ecosystem of our lake. These things are mixing together. More importantly, the fish have no choice but to swim in the waters that have these chemicals in it. Thomas said most of Lake St. Clair is unaffected by these dumps. Lake St. Clair is flushed every seven to nine days. Gutow hopes that is true, but he isn’t betting his life or his children’s fishing future on it. “My hope is that politicians will begin running on platforms that protect our aquatic resources and find ways to stop polluting them,” he said. “Lake St. Clair is one of the greatest lakes in the world. We have giant muskies and perch and bass and shoot carp. We need to keep it that way and restore it, too. “The more people that follow us on Facebook or Twitter, the more politicians will work toward solving these problems. There’s not one answer, but there can be a happy ending. Go to SaveLakeStClair.com for more information about efforts to stop the pollution.